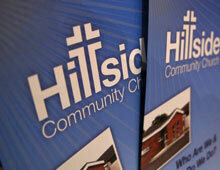 Hillside Community Church is a growing body of ordinary people who are committed to following Jesus Christ. Having begun life over 30 years ago, then as Dunclug Gospel Hall, we are now independent of any denominational label. Our members have come together from a wide range of church backgrounds and some are relatively new Christians. So, whether you are just curious about Christianity, or are a committed Christian who wants to grow stronger in your faith, you can find a home here at Hillside. As well as providing a warm environment for visitors, Hillside members are characterised by a genuine love for each other. Though relatively small in number (currently around 75 adult members), we believe this offers a unique sense of family, within which we can support and encourage one another. 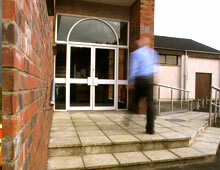 Visitors, whether individuals, couples or families, are always made welcome at Hillside. Our services are relaxed and informal; some people dress smartly and others are more casual, so whatever you are wearing, you won’t feel uncomfortable. You will be greeted at the door by one of our welcome team. Our Sunday morning service starts at 10.30am, and finishes around 12.00pm. It is mainly led from the front, by a chairman and a music team, but also incorporates a short time of open worship, when both men and women are encouraged to participate by praying aloud, suggesting a hymn to sing together or sharing some Bible verses. This time concludes with the sharing of Communion and is followed by Bible teaching from one of our members or a guest speaker. During the teaching time, children of nursery school age and younger are welcome to join the creche or ‘Explorers’. We also reserve the back few rows for families of young children, so parents can feel free to come in and out of the creche room throughout the service as necessary. Tea, coffee and some buns or biscuits are served immediately after the morning service. ‘BibleTime’, for primary school aged children, take place at this stage. The format and content of our Sunday evening meetings, on the first & third of the month at 6.30pm, varies. A key part of each night is an opportunity to get to know each other better with conversation over supper, from 7.30pm onwards. This is served in our minor hall, which is set out with small coffee tables and chairs. For more details on our Sunday services, see the ‘What We Do’ and ‘What’s Happening at Hillside this Month?’ sections of the site. Worship, Communion & Bible Teaching. Followed by tea/coffee and fellowship time. Creche & “Explorers” for infants and pre-school age, runs from 11.30am. Home Bible Study and Prayer Groups, followed by supper. “Handmaids” ladies’ craft group. Light refreshments provided. What’s Happening on Sundays this month?